The upgrade, said Icra, takes into account the “robust internal accrual generation, leading to low reliance on debt, as well as gearing levels, and strong debt protection metrics”. For the first time, Patanjali Ayurved, co-founded by yoga guru Ramdev and his deputy, Balkrishna, has got a rating upgrade. Icra has revised its long-term rating upgrade for the company from the earlier ‘A-’ to one of ‘A+’, for Rs 300 crore of fund-based facilities. And, it also upgraded the short-term ratings from A2+ to A1 for Rs 20 crore of non-fund based facilities. This indicates growing confidence in Patanjali’s financial health. The facilities in question pertain to loans the company has taken for expansion and working capital. The report also says Patanjali has a comfortable liquidity position and is cushioned against a slowdown due to its presence in multiple categories across the fast-moving consumer goods (FMCG) value chain. The Icra report also does point to risks, such as the fragmented nature of FMCG, over-dependence on Ramdev and high working capital requirement. However, experts say this is better than in the past, when CARE suspended its rating for failure to provide information about business operations. Last year, another agency, Brickwork, had assigned only a stable rating (AA-) to the company as Patanjali began redefining the ayurveda-FMCG space. A change in rating within a year, therefore, say sector observers, indicates that third-party agencies believe Patanjali can repay its loans without a hitch. This comes as Patanjali aims to double its turnover from nearly Rs 5,000 crore in 2015-16 to Rs 10,000 crore this financial year. In 2014-15, its turnover was Rs 2,006 crore. Icra said Patanjali continued to push new products, giving it one of the widest portfolios among consumer goods entities. In two years, Patanjali has entered almost every category in food and FMCG, giving a tough time to incumbents. That includes the largest in the consumer goods segment, Hindustan Unilever (HUL). Last month, HUL announced it was launching a slew of personal care products, under ‘Lever Ayush’, in a bid to take on Patanjali. Dabur, Emami and Colgate-Palmolive, which have all faced the Patanjali heat, have all attempted to ring-fence themselves with better products. Baba Ramdev has indicated the aim is to take Patanjali’s annual turnover beyond Rs 20,000 crore in the next few years, for which it would expand manufacturing and distribution. Around six new units are to come up at Maharashtra, Uttar Pradesh and Madhya Pradesh to meet demand, he has said. The company is also looking to export its products to at least 12 countries. 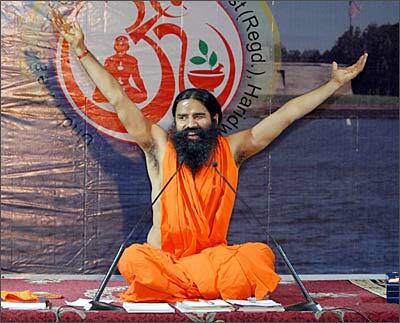 Image: A file photograph of Baba Ramdev in New York. Photograph: Rediff Archives. What should Baba Ramdev launch NEXT?